I received this awesome book as a graduation present but haven’t had a chance to use it until now. I decided to bake the coconut tea cake because mom signed up to bring dessert for some meeting tomorrow. The double dose of coconut (3/4 cup shredded coconut and 1 cup coconut milk) also caught my eye because I love coconut but do not often bake with it — we usually make Thai curry using the milk. Even though I know I should follow new recipes verbatim on the first go, I could not help reducing the sugar content from 2 cups to 1 1/2. My shredded coconut was sweetened, and 2 cups of sugar for one cake is too much. Plus, my mom is feeding it to Asian moms who unequivocally prefer less sweet things (or so they insist). I did not toast the coconut, though it was an option, which I think I will try next time because because there will be a next time with this delicious cake. 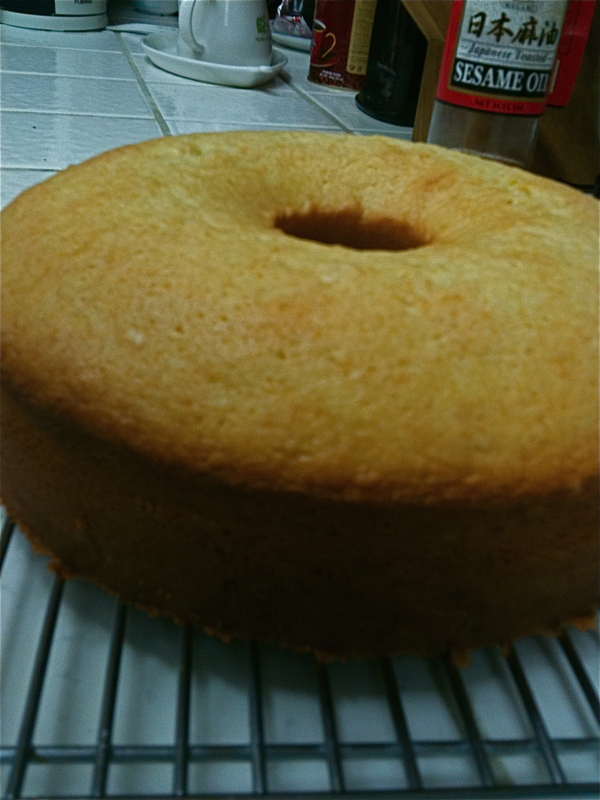 Another change: I used an angel food cake pan instead of a bundt pan, which I don’t have. I love the texture of the cake, a crusty exterior gives way to a soft, spongy interior, and the entire thing emits a wonderful coconut-vanilla fragrance, two of my favorite things in the world. Please note that I have not even had a piece of the cake yet. This is all speculation based on what I can see, smell and feel without actually tasting the cake — you can tell a lot from cake crumbs. I like that Dorie offers variations on the cake, including: lemon coconut tea cake (add lemon zest and 1 tbsp lemon juice), orange coconut tea cake (orange zest and orange juice/liquor), and lemon sesame tea cake (add sesame seeds). I will definitely have to try the sesame version! I love black sesame seeds. I want to try Dorie’s world peace cookies, espresso shortbread cookies, various brownies, pumpkin muffins and tiramisu cake. Funny how I never cite Dorie herself, but Smitten Kitchen does such a wonderful job of testing out Dorie’s recipes, I am always inspired. I finally tried the cake, and I really liked it. I will toast the coconut next time, and I might add the 2 cups or sugar. Or I would make a lemon glaze with lemon juice and powdered sugar. I am also thinking about a coconut glaze (coconut milk and powdered sugar). The cake was very plain, but the texture was perfect. I think it could use more coconut flavor. The recipe suggest rum, which would be really good.